The Nepali side congratulated China on the successful conclusion of the 19th National Congress of the Communist Party of China (CPC) in 2017 as well as the annual sessions of the National People’s Congress (NPC) and the Chinese People’s Political Consultative Conference (CPPCC) in 2018. 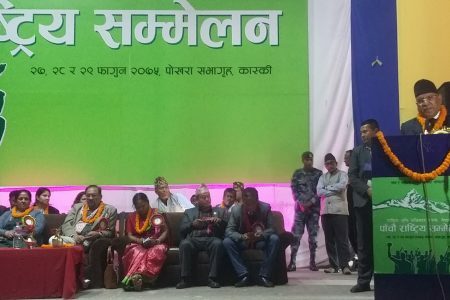 The Nepali side expressed its confidence that under the guidance of Xi Jinping Thought on Socialism with Chinese Characteristics for a New Era, the Chinese people will realize the two centenary goals and build China a great modern socialist country that is prosperous, strong, democratic, culturally advanced, harmonious, and beautiful. 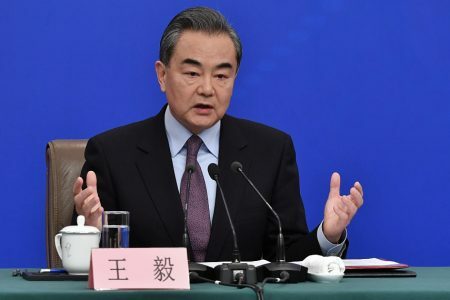 The two sides agreed to intensify implementation of the Memorandum of Understanding on Cooperation under the Belt and Road Initiative to enhance connectivity, encompassing such vital components as ports, roads, railways, aviation and communications within the overarching framework of trans-Himalayan Multi-Dimensional Connectivity Network. The two sides also agreed to take practical measures to promote cooperation in all fields contained in the MOU. The Nepali side conveyed its readiness to facilitate more Chinese investment in infrastructure building and in other productive sectors. 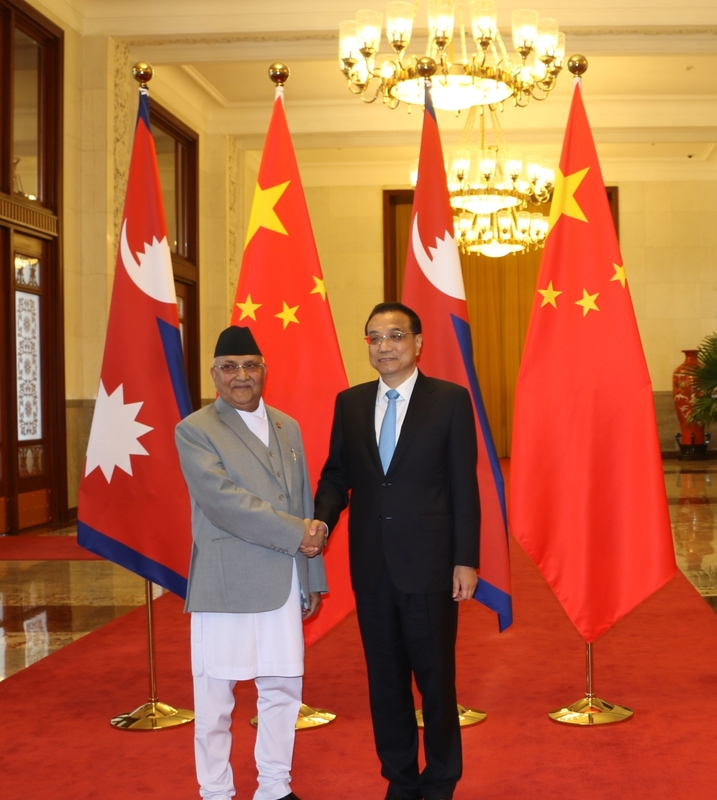 In this regard, the Nepali side expressed its willingness to welcome further investment from Chinese enterprises and, in accordance with Nepali laws and regulations, simplify the related approval procedures on applications related to land, taxes and visas in an efficient manner, and create a favourable investment climate and business environment for Chinese enterprises. Both sides expressed happiness over the conclusion of: Agreements on the Reconstruction of Friendship Bridge and Resuo (Rasuwa) Bridge; Protocol on the Utilization of Highways in Tibet Autonomous Region, China by Nepal for Cargo Transport; Memorandum of Understanding (MOU) on Investment and Cooperation on Production Capacity; the MOU on the Establishment of Mechanism for Facilitation on the Implementation of China-Nepal Cooperation Programmes and Projects in Nepal between the two Foreign Ministries; MOU on Strengthening Cooperation between the two Foreign Ministries; MOU on Energy Cooperation; Agreement on Economic and Technical Cooperation; and MOU on Human Resource Development Cooperation. The two sides agreed to further deepen cooperation in economy, trade, investment, industrial capacity, post-disaster reconstruction and other mutually beneficial areas. The Chinese side agreed to take positive measures to facilitate Nepal’s export to China and consider providing technical and financial assistance for product development and post-harvest technology in agro-products. The Chinese side will consider providing necessary technical support for the establishment of laboratory and quarantine facilities in Nepal in order to facilitate the export of Nepali agricultural products to China. Both sides agreed to open additional trade routes between the two countries through mutual agreement and encourage financial transactions through banking channels. Underlying the importance of generating a win-win situation for both countries, the two sides will constructively engage in finalizing the joint feasibility study on China-Nepal Free Trade Agreement (FTA). The two sides will strengthen cooperation both at central and local levels to promote establishing cross-border economic cooperation zones as per the MOU signed between the two countries. The Chinese side agreed to complete the Post Disaster Recovery for Tatopani Frontier Inspection Station Project at Larcha and Frontier Inspection Station at Timure, Rasuwagadhi at an early date. The Nepali side will provide its full support and comprehensive cooperation to the construction of the two frontier inspection station projects. Both sides agreed to develop other dry ports at mutually agreed Nepal-China border points. China welcomed Nepal’s participation in the first China International Import Expo to be held in Shanghai in November later this year. The two sides agreed to promote exchanges and cooperation in education, culture, tourism, media, think tanks, youth, and people-to-people relations. Both sides agreed to encourage the establishment of sister city relationship between different cities of the two countries. The Chinese side agreed to encourage the Tibet Autonomous Region as well as Sichuan, Yunnan and Qinghai and other provinces to enhance cooperation in the areas of trade, tourism and investment, among others. The Chinese side welcomed Nepal’s participation in the China International Travel Mart (CITM) this year, and would continue to help arrange Chinese media and travel agency delegations to visit Nepal and encourage relevant Chinese agencies to further promote Nepal in China in view of upcoming Visit Nepal Year 2020. The Chinese side agreed to continue providing Chinese language training in Nepal for Nepali tourism professionals to help promote Nepal’s tourism industry. The Chinese side also agreed to provide around 400 training opportunities in human resources development and more government scholarships every year to Nepal. The Nepali side reaffirmed its full commitment as specified in the MOU in 2014 between the Ministry of Education of Nepal and the Chinese Embassy in Nepal, for facilitating the teaching program of volunteer Chinese language teachers in Nepal.